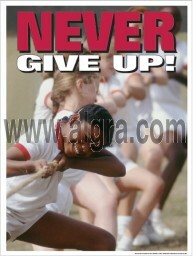 The Never Give Up Poster is intended to remind children not to give up while participating in a sport. The poster uses an inspirational image and text to promote the message. This poster is a great addition to any education facility. Inspirational photo with inspirational words "Never give up!" 18" x 24" poster available in Paper, Laminated, and Framed.